Improper integrals are useful for solving a variety of problems. A vertically infinite improper integral contains at least one vertical asymptote. Vertically infinite improper integrals are harder to recognize than those that are horizontally infinite. An integral of this type contains at least one vertical asymptote in the area that you’re measuring. (A vertical asymptote is a value of x where f(x) equals either or –.) 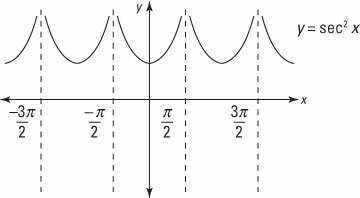 The asymptote may be a limit of integration or it may fall someplace between the two limits of integration. Don’t try to slide by and evaluate improper integrals as proper integrals. In most cases, you’ll get the wrong answer! There are two cases where you’ll need to handle vertically infinite improper integrals. At first glance, you may be tempted to evaluate this as a proper integral. But this function has an asymptote at x = 0. The presence of an asymptote at one of the limits of integration forces you to evaluate this one as an improper integral. If a function is continuous on an interval, it’s also integrable on that interval. Some integrals that are vertically infinite have asymptotes not at the edges but someplace in the middle. The result is a discontinuous integrand — that is, a function with a discontinuity on the interval that you’re trying to integrate. Discontinuous integrands are the trickiest improper integrals to spot — you really need to know how the graph of the function that you’re integrating behaves. To evaluate an improper integral of this type, separate it at each asymptote into two or more integrals. Then evaluate each of the resulting integrals as an improper integral. in shown in this figure. Now evaluate the sum of the two resulting improper integrals. from the left — that is, from inside the interval where you’re measuring the area. so the limit does not exist (DNE). Therefore, the integral that you’re trying to evaluate also does not exist because the area that it represents is infinite.